The 2017/2018 Director’s Annual Report was presented to the Board of Trustees at the December 18, 2018 Regular Board Meeting in accordance with the requirements of the Education Act. The Education Act, 1990 stipulates that a Director’s Annual Report must be prepared and presented to the Board of Trustees at the first regular meeting in December. The Board’s strategic goals and progress made towards those goals. Action taken towards the promotion of a positive school climate and prevention of bullying. Training and professional development for employees with respect to equity and inclusive education. Efforts to actively engage and integrate feedback from students, parents and community partners. 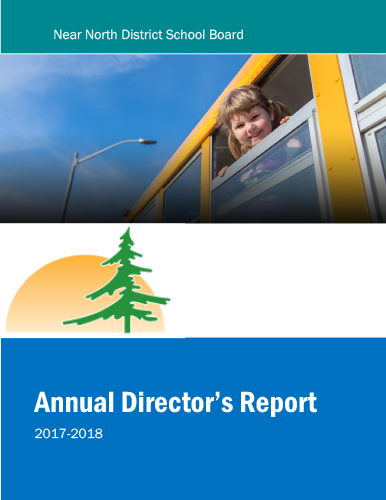 The information contained in the attached report is only a snapshot of all work, programming and accomplishments of the NNDSB over the past year. We are fortunate to have such dedicated and competent educators within our schools and Board.